MAKE YOUR MARK WITH A CLICK! ALL MONEY COLLECTED GOES TO THE MUSICIANS. I haven’t found many autographs on eBay recently that got me all excited, but this one surely qualifies. Johnson “Fat Cat” McRee, an enthusiastic concert promoter (given in moments of enthusiasm to vocalizing and kazooing) ran a series of jazz bashes in Manassas, Virginia, for perhaps fifteen years. I never attended any of them but knew of their existence because “Fat Cat” issued some of the results on his own “Fat Cat’s Jazz” label, which never made it to compact disc. 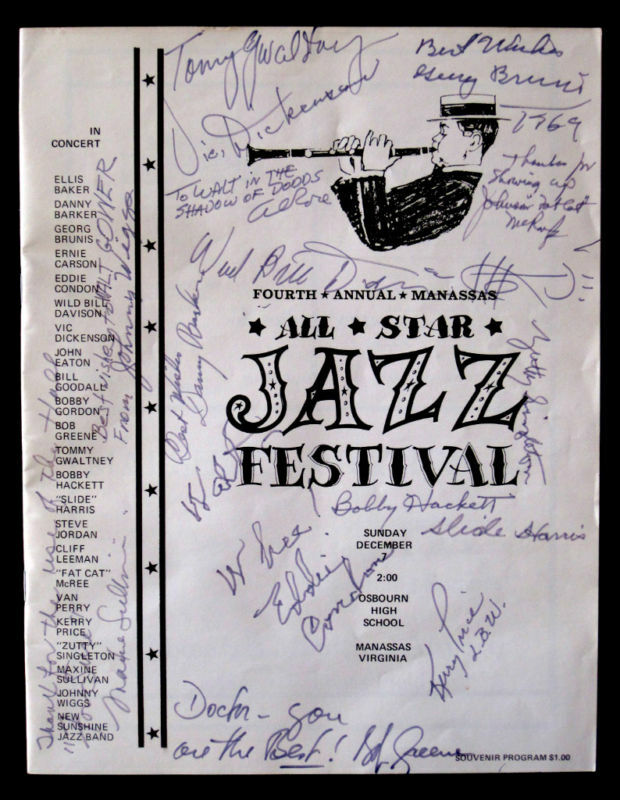 Here is an autographed program from the first concerts in 1969, with many famous names: Eddie Condon, Bobby Hackett, Slide Harris, Maxine Sullivan, Vic Dickenson, Johnny Wiggs, Danny Barker, Zutty Singleton, Wild Bill Davison, Bob Green, Georg[e] Bruni[e]s, writer Al Rose, Tommy Gwaltney, Walt Gower, Kerry Price, and one or two others. The signatures that I know — either from familiarity or from getting autographs from the musicians themselves — are absolutely genuine-looking: Condon, Vic, Hackett, Maxine. For what it’s worth! The autograph on the very bottom — indicating this program belongs to “Doctor,” suggests that it was once the property of Dr. Edmond Souchon, the New Orleans physician-guitarist-singer who was part of the 6 7/8 String Band and appeared on many recordings with Johnny Wiggs and Raymond Burke. Could this be true?